Hello Everyone! 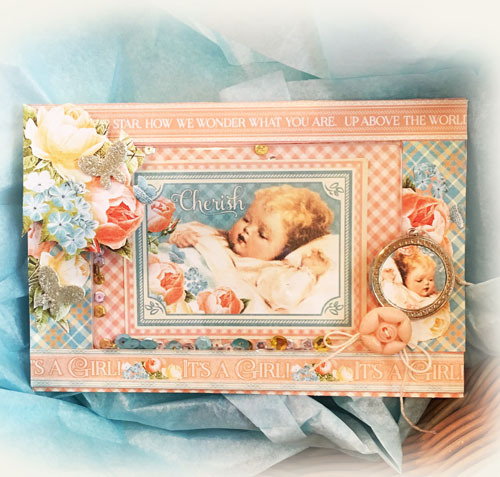 Today I thought I’d show you how I put together this special baby card that I created for my new great niece. 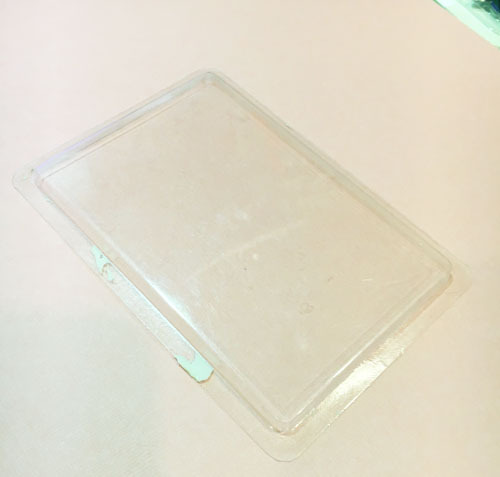 There are many different ways to go about making a shaker card, but I’m going to show you how I made this one with the protective covering dis-guarded from some other craft product packaging. 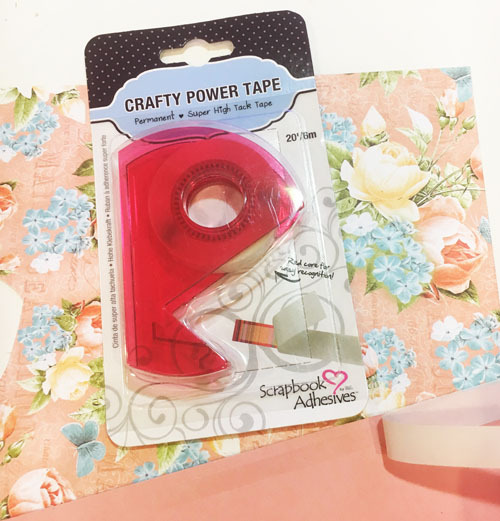 I’m sure if you look thru your craft supplies you might find these in many different sizes. I wanted one that was fairly large to fit my entire image inside. I traced the size of the plastic onto the front of my card, making sure it was centered. I then cut it out from the front of the card with my craft knife. I lined the inside of the front of the card with Crafty Power Tape. The lip of the plastic then set inside. The tape holding it tight in place. I cut a back for the inside of the front of the card centering my image on it. I made this the same size as the front of the card. 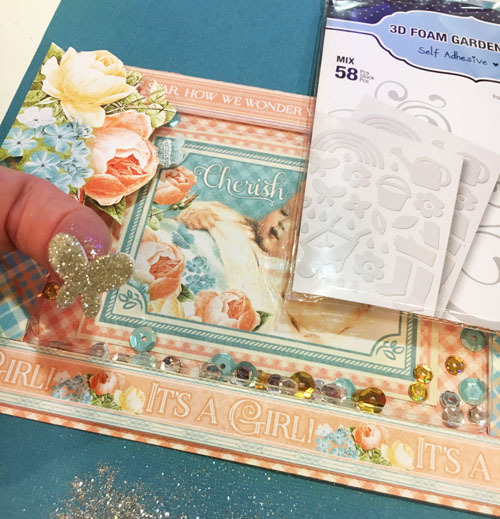 I sprinkled some sequins into the clear piece and then covered it with the piece with the image by using my E-Z Runner® Grand (making sure I added the adhesive close to the edge of the plastic piece to hold the sequins inside). 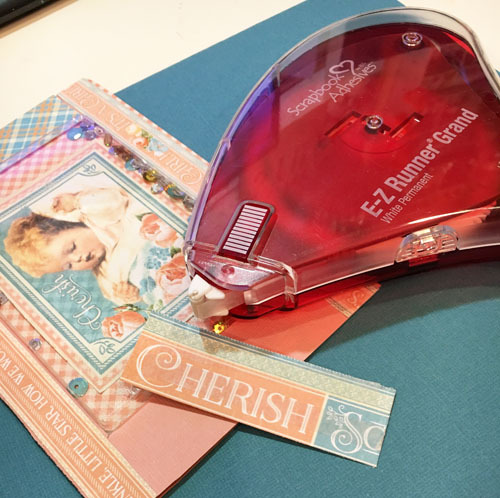 I also used my E-Z Runner® Grand for all the rest of my pieces to create my card. To give dimension to the cut out flower pieces I used Thin 3D Foam Squares. I wanted to add some of these cute butterflies from the 3D Foam Garden Shapes, so I added some gold glitter to pull in the gold from the sequins. I’m so excited to meet my new Great Niece! This entry was posted in 3D Foam Shapes, 3D Foam Squares, 3D Projects, Adhesive Dots & Lines, Adhesives, Cards, Crafts & Tutorials, Crafty Power Tape, E-Z Runner® Dispensers, E-Z Runner® Grand, Tutorial, Wear your Adhesive on the Outside and tagged 3D Foam Garden Shapes, Adhesive Dots Medium, Adhesive Value Pack, Baby, Card, Crafty Power Tape 20' Dispenser, Crafty Power Tape 20' Refill, Crafty Power Tape 81' Dispenser, E-Z Runner Grand Dispenser, Fancy Pants Designs, Glitter, Graphic 45, Sequins, Shaker Card, Thin 3D Foam Squares White, Tutorial, Vicki Chrisman, Wear Your Adhesive on the Outside. Bookmark the permalink. 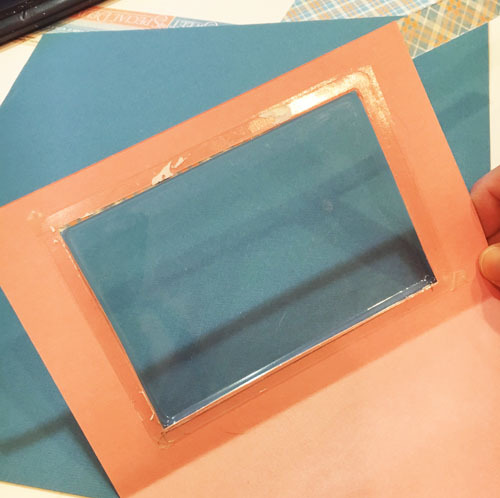 One Response to "Baby Shaker Card using Crafty Power Tape"
Beautiful project as always. I love it Ms. Vicki.